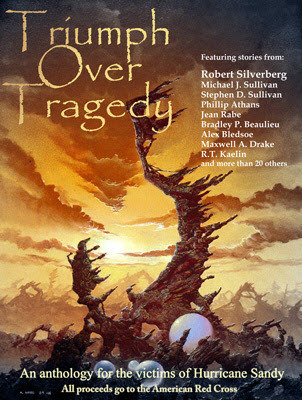 Triumph Over Tragedy is now available! I haven’t been quiet about my efforts to promote Triumph Over Tragedy recently. Nor have I been quiet about the fact that I’m actually doing what I really want to do: edit. This is the first book that’s published that I’ve helped edit. What makes this even more cool is that all the proceeds from this wonderful anthology go directly to Hurricane Sandy relief. You get an amazing book, and help people get their lives back at the same time. Amazon took forever to get the book published, but it finally went live! It’s only available in ebook for $6.99 (Yes, we realize there is a minor typo. It happens. It’s getting fixed. Amazon is just taking forever about it.). Soon, today or tomorrow (hopefully) it will be available on Barnes and Noble as well. While most of this book is speculative fiction, there are other genres thrown in on occasion to add a little spice. The underlying theme of this book is, you guessed it, triumphing over tragedy. So check out this link to purchase the book on Amazon. When it goes live on Barnes and Noble, I’ll update this post with that link. As if that’s not cool enough, you know what’s really amazing (to me)? My name is in the Edited by column!